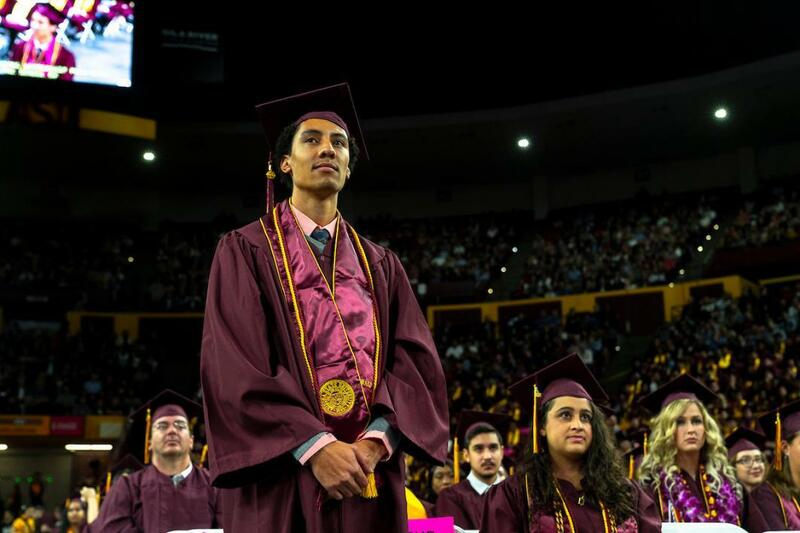 Sean McElroy, graduating with a degree in sustainability, stands during graduation to be recognized by University Provost Mark Searle for his exemplary scholarly performance at ASU. The graduates sitting in front of me know that we are living in exciting and challenging times. Even though understanding the present, let alone the future, is exceedingly difficult, in SOS we share the belief that the world is on the cusp of significant change. And we need to drive that change so that it is equitable, enduring, secure, and sustainable. History shows that positive transformation is possible. When the Millennium Development Goals challenged the global community to cut in half the number of people living in extreme poverty and suffering from hunger by 2015, many thought the goals were too ambitious and impossible to achieve—that disappointment would lead to disillusionment. Instead, the world met or exceeded those goals, reducing the number of people living in extreme poverty from 50 percent to 14 percent and the number of undernourished people from 24 to 13 percent. Success from the Millennium Development Goals inspired people to aim even higher in creating the Sustainable Development Goals. Most of you probably know all 17 by heart. Maybe you have them on your mortarboards or as an app on your phone. Any one of them I hope will inspire you to think about how to accelerate the transition to a desirable, sustainable future—one that celebrates clean and affordable energy (#7), sustainable cities and communities for an urbanizing planet (#11), protection and restoration of earth’s ecosystems (#15), inclusive and sustainable growth (#8), availability and sustainable management of water for all (#6). My challenge to members of this graduating class is that you will together speed up the transition to a sustainable world, one that allows people and planet to thrive, not just survive. I also recognize that each of you today is going through a personal transition, from student to graduate. Transitions can be incredibly exciting and joyful, but also laden with uncertainty, trepidation, and even fear. It is perfectly normal to feel both. But I ask you to draw on your inner optimist and change-agent selves, and embrace transition as an extraordinary, thrilling, and fulfilling set of opportunities. I know this focus on opportunity for positive change, rather than doom and gloom, is what inspired many of you to come to SOS in the first place. Don’t lose that fire and spirit. Finally, remember that as you start your next chapter, you will not be alone. You are now and forever will be part of the SOS family. More than anything, we want to help you succeed. Visit us often and keep in touch. Lean on each other. Take care of one another. Successful transitions to a better future will take teamwork, a shared vision, perseverance, and the passion each of you has inside to change the world for the better. Congratulations Class of 2018! Here is my September video address to students about new and upcoming opportunities in the School of Sustainability. We have record enrollment this year and students joining us from across the country and around the world. As I noted in an earlier post, students in the School of Sustainability are coming from far and wide to study with us. This year, we have students from 24 countries in our undergraduate and graduate programs. The diverse origins of our students reflects the strong international reputation of ASU’s School of Sustainability. Having students from all corners of the globe is also an extraordinary gift. When I was a graduate student at the University of Toronto, a large and impactful part of my education was learning alongside students from other parts of the world. I was fortunate to be in a graduate program where more than half of the students were from countries other than Canada. I have not forgotten how valuable that experience was. I am committed to making sure that our own students benefit from global experiences, whether learning with students from other parts of the world or learning in other parts of the world. This year, Dr. Rob Melnick has taken on the responsibility of coordinating and enhancing all of our international efforts. The purpose is to make sure that students recognize the range of global experiences available to them–lots of exciting things to come! The School of Sustainability (SOS) continues to grow in size, reputation, and reach. Data from this year’s class show that students come from 42 states and the District of Columbia. I am proud that SOS serves the nation by providing an excellent education for students from all parts of the country (and many parts of the world: see next post). This year we have more than 500 undergraduate majors and 200 graduate students studying with us in SOS. When we add the sustainability minor, sustainability concentrations in business, engineering, public policy, and interdisciplinary studies, along with the certificates in sustainability food systems and energy systems, I anticipate the total number of students in sustainability programs will exceed 2,500 by the end of the year. What all of this exemplifies is ASU’s institutional commitment to sustainability, inclusivity, and impacts that reach far and wide. Many things about graduation are based on traditions that go back almost a thousand years, including the gowns we wear. Thankfully, we wear these “regalia” only a couple of times per year. The word “convocation” comes from the Latin words “con”, meaning together and “vocare”, meaning to call. So, convocation means a “calling together,” in this case to celebrate the students graduating here today. But it also to call together the family, friends, staff, and faculty that provided the support and guidance to make sure all of these students sitting in the front rows could reach this watershed moment. To the students, I know all of you are excited to be graduating, as you should be. But with any transition, there is always some degree of anxiety and uncertainty. For the past handful of years, you have been able to explore, grow, and learn in a nurturing environment, guided by faculty and staff that care about your well-being and want nothing more than to see you succeed. Leaving that environment and venturing out on your own can be unsettling. I understand that. The one thing I want all of you to remember is that you are certainly not on your own when you graduate from the school. You are and always will be part of the SOS family. You will be joining nearly 2,000 alumni who have gone on to do incredible things; achievements we never could have envisioned when we started the school some 11 years ago. You will come to rely, as past graduates have, on the alumni and school networks for support, for the generation of novel ideas, and for pathways for getting things done. All of you know that sustainability challenges and opportunities are complex, meaning that no individual alone can tackle them in a meaningful way. You will need to lean on each other to move the needle on sustainability, something which I know inspired all of you to join the school in the first place. To make positive change, don’t forget to “call together” your sustainability allies, your alma mater, and the lifelong friends you have made at ASU and the School of Sustainability. Remember the words: Con Vocare. Those words are not just for graduation. They should serve you for life and help you, working with others, to build a better, more humane, and sustainable future. The ASU Charter contains very powerful language about principles of inclusion. For quite some time, universities have measured their excellence by their selectivity. In some of the most selective schools, this can translate into admitting less than 10 percent of applicants, who in many cases are very high achieving and accomplished students. National ranking systems use the selectivity measure as part of their ranking calculations. Commitment to this principle has produced remarkable achievements. 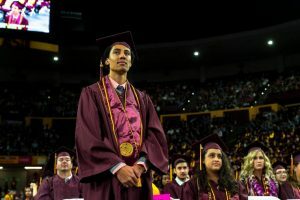 ASU’s incoming class now reflects the demographics of the state of Arizona along all social, ethnic, and economic dimensions. 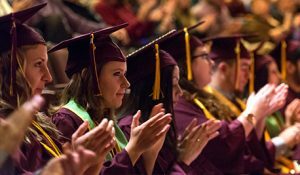 In 1985, less than 2 percent of the students at ASU were from the bottom half of family incomes but now that figure is 50 percent. At the same time, graduation rates have vastly improved since the mid 1980s. 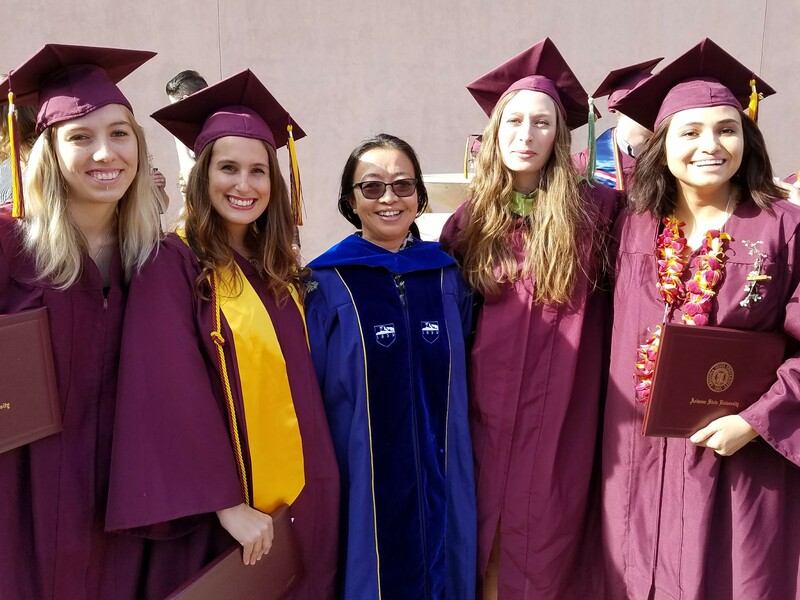 ASU has held fast to accepting A and B students while undergoing the highest growth in research expenditures of any university in the country. The evidence shows that it is possible to educate a broad spectrum of society and be a research powerhouse at the same time. One does not have to come at the expense of the other. Indeed, I believe the strategies are mutually reinforcing. Inclusion means, in part, not excluding the good ideas, experiences, and insights from a diverse cross section of society. For some time, business has recognized the value of the diversity dividend. Simply put, a diverse work force translates into increased profits and financial performance. Inclusion and diversity are important to the health of any organization. A second and equally important reason for promoting diversity and inclusion is the ethical responsibility universities have to the public. Citizens of Arizona rightfully expect children of all family backgrounds to have the chance for an education. It is the right and fair thing to do. A college education remains the single best predictor–by far–of social mobility. A college education prepares individuals for a fulfilling and meaningful life while contributing to the overall health and well being of the community. Yet inclusion in college does not just happen. It requires vigilance. It requires all of us to make the effort to reach out, welcome, and listen to those who may feel that college is not for them. It means developing pathway programs for students in high schools that do not typically send students to college. It means inviting students to campus to demystify what it means to be a college student. It means creating an environment on college campuses (including online) where all people are respected and listened to with an open mind. It means that all are welcome. The future success of universities, and the societies they serve, depends on it. Deans of colleges and schools have an annual ritual. Each fall, they greet their incoming class of freshmen – excited, hopeful and mostly young minds ready to enter adulthood, citizenship and self-sufficiency. These students have worked hard to get into the school of their choice, and now their journey begins. This meeting is a blend of informational, inspirational and joyous. Often sitting beside these excited young students are their equally excited parents, who have sacrificed to enable their children to reach this auspicious moment. They dream their children will become the proverbial “doctors and lawyers and such,” and also artists, engineers, historians, teachers, journalists and other well-known vocations. But when the dean of a sustainability school addresses an incoming class, something curious happens. Every time. When Arizona State University opened its School of Sustainability in 2006, it was widely considered to be the first school of its kind in the U.S. To be honest, nobody knew how many students would enroll, let alone where they would work after graduation. By comparison, today there are hundreds of sustainability programs offered by universities, and employers of all sorts are keenly interested in their graduates. A 2016 survey of ASU’s undergraduate sustainability alumni showed that 96 percent were employed or attending graduate school. What’s more, 67 percent of employed students were working in sustainability-related jobs – more than twice the national average for major-to-career match. But how can this be? After a decade of working with sustainability alumni and their employers, we know that sustainability is more than just a major. It is also a value – a set of principles by which to live one’s life, treat humankind and the Earth – all in a way that helps create a prosperous future for everyone. Employers of all kinds are attracted to workers who hold these values and have attained the skills that sustainability students are required to master – systems-level, future-focused thinking and the ability to engage and collaborate with stakeholders to develop and implement solutions, among other skills. In 2006, we couldn’t predict who would employ our graduates, other than perhaps the obvious environmental and conservation-oriented organizations. But since then, our graduates have consistently gotten good jobs at top-notch companies, important government agencies and major international nonprofits. Some examples: Amazon, PepsiCo, Walmart, NRG, Tesla, cities throughout the U.S., GE, Rolls Royce, Waste Management, World Wildlife Fund, USAA Insurance, Owens-Corning, Sandia National Labs, Dell. So, when this dean greets incoming sustainability students, he understands the earnest concerns parents have about their child’s employment prospects. But he is also confident that these fears will, on graduation day several years from then, have been allayed. This short article appeared in a number of newspapers in the Valley and across the country. This spring we start a new tradition. Attached to the gowns and hoods of our graduates are small branches of palo verde. 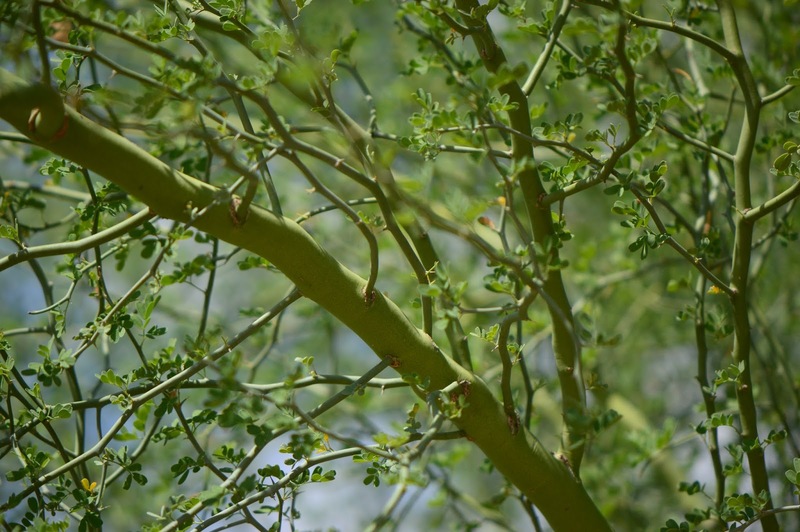 One of the most common trees in the Sonoran Desert, the palo verde is also the state tree of Arizona. What astonishes most visitors when they see palo verde trees is the green bark and branches. We locals know that this allows the trees, which often shed their small leaves during hot and dry periods, to continue photosynthesizing – to convert the sun’s rays into useful chemical energy. If there is sufficient rainfall, in the late spring, they produce bright yellow flowers that nourish pollinators and produce seed pods, a source of food for birds, rodents, and, particularly in the past, for people. These beautiful trees have adapted to the difficult conditions of the desert. Mature specimens can live for hundreds of years. They are a reminder that even in harsh environmental conditions–with little and unpredictable rainfall, seething heat and freezing temperatures–life can adapt and thrive and bring beauty and sustenance. As you graduate and go out into the world, at some point you will likely encounter your own difficult environments. You may have co-workers who doubt your novel ideas. 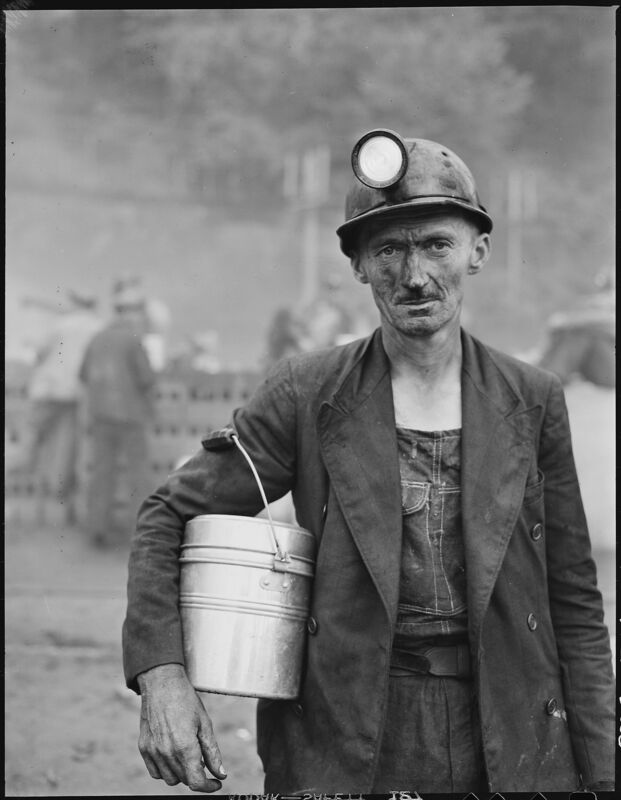 You may work for bosses who are perfectly satisfied with the status quo and won’t budge. Banks and investors may be skeptical of your innovative business plans. Decision makers may dismiss your forward thinking interventions. Community members may not initially welcome you. But when these challenges arise, think of the palo verde. Your good ideas, your energy and passion for creating a better, sustainable future need to see the light of day. Don’t let difficult environments discourage you. Use the problem-solving skills and the positive, solutions perspectives you learned in the School to overcome the doubters, the naysayers, and the short-sighted. I am confident in your resilience, knowing you have the skills and drive to grow and thrive in the face of difficult and entrenched challenges. Most importantly, remember that you are not in this alone. You are joining more than a thousand SOS alumni who are ready and willing to support you–to help you launch your careers, listen to your challenges, find solutions, and realize your dreams–just as other alumni did for them. And remember that you are a part of the School of Sustainability family forever. You will always have a place here in this beautiful desert we call home. This has been a year of surprises. Around the world, many were shocked by the “Brexit” vote, committing the United Kingdom to leave the European Union after more than 40 years. The results of the US federal election caught many off guard. The Chicago Cubs won the World Series. And Bob Dylan received (well, was awarded) the Nobel Prize in literature. Change can be unsettling, but it also brings opportunity. Your degrees in sustainability I firmly believe are more important than ever. While the winds of change can shift direction quickly, the commitment to sustainability in many private, public, non-profit and religious organizations remains firm. We have reached a kind of sustainability “lock-in” that would be very difficult, although not impossible, to dismantle. Of course, this kind of experience in persuading others about the importance of sustainability – from practical and ethical standpoints – is something all of you have lived over the course of your career in SOS. As you launch into the next stage of your life, you will not always be surrounded by like-minded people. Indeed, you were not at ASU and even in the School of Sustainability. Negotiating different sets of worldviews and priorities to achieve common goals is something you are all very well prepared to do, and I am confident you will. This century belongs to you. And to your children and grandchildren. You will be the leaders at a critical time in human history. I know you will be smart, motivated, and ethical with the decisions you make—individually and with others—to design and build the future we want and need.